Easy to read yet technically precise, MODERN DIESEL TECHNOLOGY: HEATING, VENTILATION, AIR CONDITIONING, AND REFRIGERATION, 2nd Edition is the text of choice for many of the country's best diesel technology programs! Detailing the foundations of truck heating, air conditioning, engine cooling, and truck-trailer refrigeration, the book integrates modern technical terms with photos that clearly demonstrate typical, on-the-job tasks in logical sequence. Coverage includes an entire section on thermodynamics, as well as solid instruction on safety, equipment, components, troubleshooting, performance testing, maintenance, and even the history of HVAC/R in the diesel trucking industry. 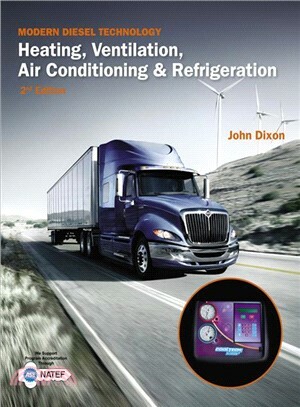 Enhanced with photos, drawings, and self-testing questions in each chapter, MODERN DIESEL TECHNOLOGY: HEATING, VENTILATION, AIR CONDITIONING, AND REFRIGERATION, 2nd Edition delivers the technical accuracy and depth of HVAC/R information you need for a rewarding career as a diesel technician.